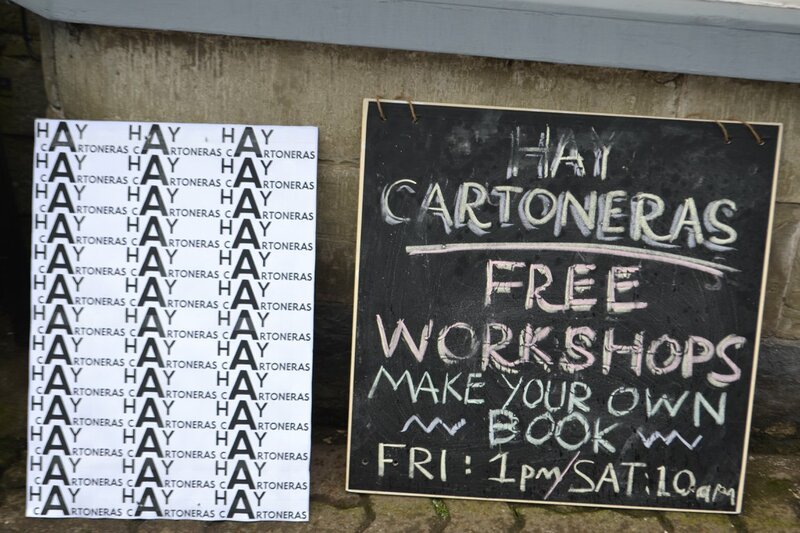 In the spirit of cartonera fringe events at the world’s largest annual book fair in Guadalajara, Mexico, we decided to run two days of free cardboard book-making workshops for the public in Hay-on-Wye during the 2018 Hay Book Festival . The workshops were accompanied by short, informative talks about our research and the cartonera movement in Latin America, and by the UK premiere of two of the short films that we have produced about cardboard bookmaking in Zacatecas and Cuernavaca. Adults and children alike produced a special edition of a bilingual Spanish-Nahuatl book brought out by our partner, La Cartonera from Cuernavaca, and stamped it with a logo designed by publishing partners Impronta in Guadalajara. We all had a chance to practice our Spanish and Nahuatl! The workshops involved a collaboration with the Story of Books, an initiative to create a dynamic working museum that celebrates the ongoing story of books. The Story of Books provided a wonderful central space in Hay for the workshops to take place, and an enthusiastic group of teenage helpers who will continue the cartonera legacy in Britain’s most famous book town! The workshop was really fun and creative, you had to use your imagination. The technique wasn’t so difficult after watching the video either. On one of the sides of the book I did a solar system because I love space, and on the other side I just did some bunting and plants because I thought it looked pretty! And I had a cactus to represent Mexico! I found the workshop really exciting and it was great to be here, to have the opportunity to make one myself, but also to be in a lovely group activity. As an artist, I love and often work with cardboard, so I was really excited to hear about cartonera. I think that it’s great to use a really humble material and make it into something really beautiful.